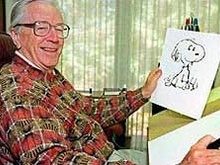 Courageous Christians United - Blog - Did Charles Schulz Really Love His Daughter? "Concerning my membership in the LDS church (Mormons) it was asked of me whether my dad and I had many discussions about religion. Ironically, we did not ever discuss religion. This is why: my dad spent a great deal of his life studying the Bible. I have images of him sitting in his big, yellow chair, reading the scriptures and marking them extensively. He taught Sunday school for 12 years out in Sebastopol, not to mention his involvement with the Church of God in Minnesota. When I told him that I was joining the Mormon church, I knew that it was a church he did not believe in at all. Because of the wonderful relationship we had with each other, it was instinctive of us to know that discussing religion would not do either one of us any good. I had WAY too much for respect for dad’s religious knowledge and he had WAY too much love for me, his daughter, to ever say anything. We never wanted to hurt one another." Schulz loved his daughter too much to ever say anything to her? Of course, it is always possible that Schulz really did love his daughter and was not aware of the heretical nature of Mormonism. After all, Mormons do a good job at hiding what they really believe about the fundamentals of their faith (see “Lying for the Lord”). The problem with this possibility, though, is that Schulz's daughter stated that her father did not believe in the Mormon Church "at all." It is also possible that Schulz regarded religion as merely a subjective truth. A subjective truth depends on the individual. An objective truth is true regardless of the individual. For example, for me, it is a subjective truth that chocolate ice cream is better than vanilla. For my wife, the opposite is true. It depends on the individual. For those who regard religion as merely a subjective truth, in us God lives and moves, and has His being. As such, subjectivists would never argue about which religion is true. If people don’t like what we like, there is no sense in forcing the issue. It would be as silly for me to argue with my wife over what flavor of ice cream is better. Subjectivists advocate learning to tolerate and celebrate the diversity of our beliefs. Well, at least tolerate and celebrate diversity to the extent that most of us like. I wonder if Schulz would have said anything to his daughter if she joined the Branch Davidians, for example. One may argue that surely he would have warned her given the hindsight of their mass suicide. Any loving father would have to warn his child of such danger. But in a certain sense, those who join any false religion are committing mass suicide. They reject what may be objectively known of God, pursue their own lusts, and thereby experience eternal judgment (cf. ROMANS 1:18-32). If committing physical mass suicide is considered objectively wrong and excludes a religion from being thought of in merely subjective terms, then committing spiritual mass suicide should also be thought of as objectively wrong. To allow only for the physical would be special pleading against the spiritual. If it is the case that a religion may be spiritually objectively wrong, then if Schulz was informed as to the heretical nature of Mormonism, he had a moral duty to warn his daughter. To do otherwise is to demonstrate, not love, but hate. Simply put, this argument makes absolutely no sense. First, Christianitity had already split from Judaism and had become a distinct religion LONG (as in hundreds of years) prior to Nicea. Generally speaking this occurred after the destruction of Herod's Temple around 70AD and Nicea occurred in 325AD. Suffice to say that by the end of the First Century AD Judaism and Christianity were distinct and separate religions. (see https://en.wikipedia.org/wiki/Split_of_early_Christianity_and_Judaism) This fact makes your argument an irrelevant straw man. Sorry. So the Jews thought that the Christians were heretics - so what? The simple fact is Christians weren't looking to the Jews to establish orthodoxy, they simply didn't care what they thought. Nor did the Early Christians claim to be Jews as Mormons claim to be Christian so your argument is a double straw man relative to the modern situation with Mormonism - it's apples and oranges Mr. Bond. Second, while the issues surrounding the split are numerous and complex none of them involved the issue of the Triunity of God, the nature of Jesus Christ or any of the other issues that were discussed and hammered out at Nicea (see http://www.equip.org/article/what-really-happened-at-nicea/) were of ANY interest to the Jews. So drawing the line at Nicea is just ridiculous, utterly ridiculous - it's a non-squitur. Third, if Mormons would cease and desist in calling themselves "Christian" and acknowledge that they are a distinct religion like the Early Christians did we wouldn't even be having this conversation. I wrote about that in this article: http://beggarsbread.org/2012/01/01/if-mormonism-isnt-christian-then-what-is-it/ I would ask the reader to consider it in light of this discussion. You're Mormons not Christians - own it. Finally, I found your final appeal amusing since the LdS Church literally has an army of missionaries on the streets trying to reach and convert "apostates" with their unheretical (by their standards), restored, Mormon gospel. Applying the same standard that you have applied with Mr. Sivulka are we to believe that they DON'T love their neighbor? That their fruit ISN'T love? Should we assume that their actions are driven by another spirit? That they DON'T have the heart of Christ? What about your comment, ditto there Mr. Bond? Sir, that sword cuts both ways - you can't use it on Mr. Sivulka and then be surprised when you get nicked by it yourself.